Aparntly nobody on dakkadakka appreciated my troll article so I'm reposting it here. Enjoy. Everyone knows Green Iz BEST! Its what makes uz ork players different from those pink and soft Oomans! However, what if I was to tell you that Orks are no longer green? What if everything you have known for the last 4-5 years was a lie? What if Games Workshop has been slowly phasing out Green Orks? Its an interesting question that this short essay of mine hopes to answer by examining the evidence found on Games Workshops very own webstore and proving that modern day orks are more like a banana than a mushroom! However, before this analyse on a subject nobody cares about begins, I would like to make it clear that I have not analysed every single Ork model ever released by GW for 40k. Moreover, I selected a handful of the newer models and compared them against a handful of the older models. Furthermore, I would also like to note that lighting in every picture probably changed and the quality of cameras and paints have also likely changed over the years so this may affect some of the analyse. 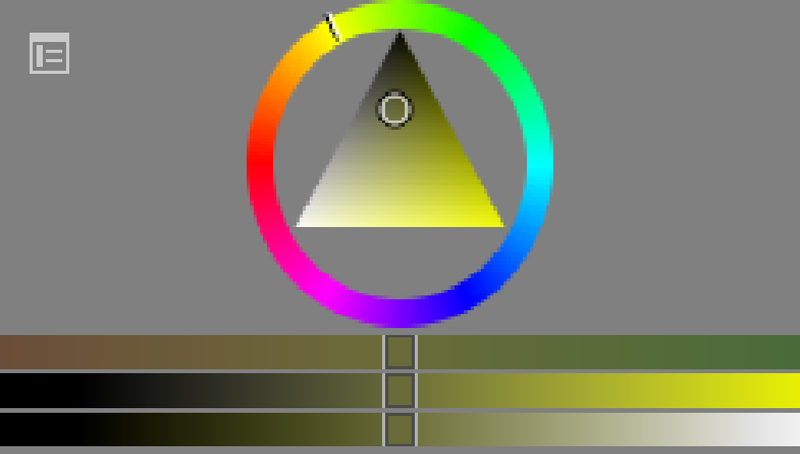 Nevertheless, I believe I have taken a large enough sample from the range to make a semi-amateur-comprehensive analyse of the colour Orks have been painted over the last 20 years. In addition, all my samples were taken from the face of the Orks in about the same area to make the analyse as fair and even as possible. Before I begin to prove that Orks have now become nothing more than angry lemons, I feel the need to explain how this subject came about and discuss to you the difference and similarities between the Fantasy Orcs and the 40k Orks. 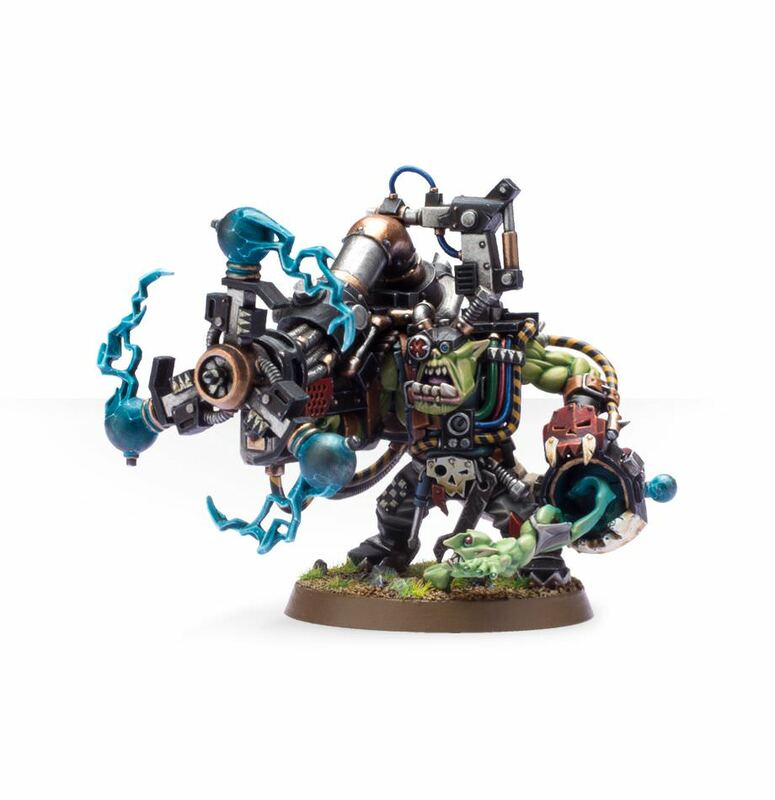 Over on the Orks rumour thread we have been doing everything but discussing rumours, frankly because GW have been avoiding Orks like theyre a failed parent who doesnt want to be reminded of that every day when they look at their child basically we have nothing to talk about rumour wise. However, recently, a subject has come up that grabbed my interest. Why do people believe the IronJawz Orcs to be less Orky than the 40k Orks? 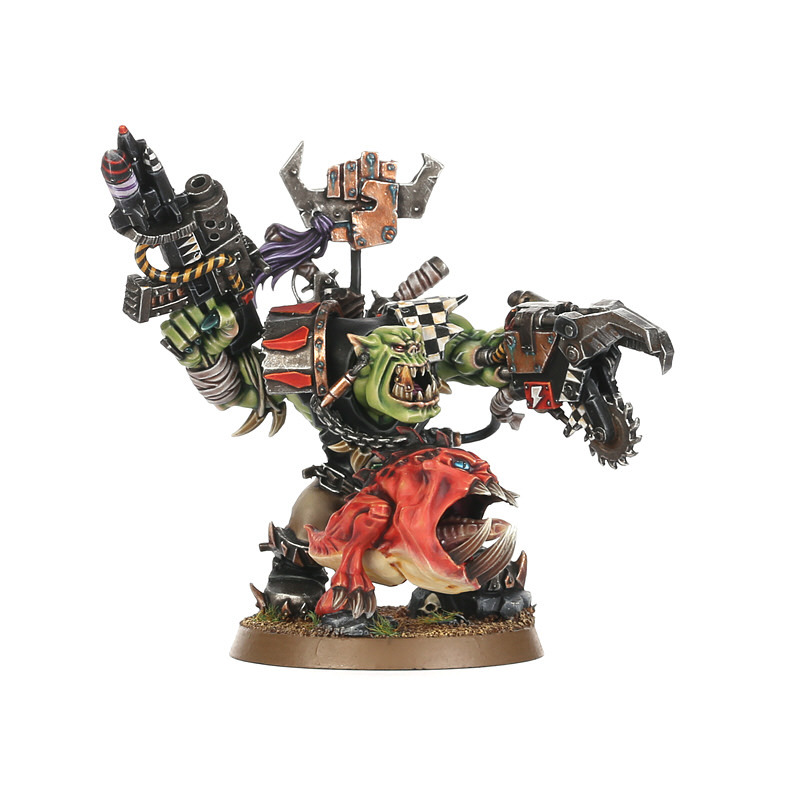 Moreover, they seem to believe there is a fundamental difference between the Age of Sigmar Fantasy Orcs and the 40k Orks that lays in the sculpts themselves that has slowly seeped its way into 40k through Flash Gitz, Big Mek, and the plastic Warboss. Firstly, while the idea that the sculpts are different is true - a quick analysis of the Orc vs Ork shows how the Orcs seem to have a more rounded sculpt with more emphasis on the mouth while the 40k Ork is more ridged and pointy with more emphasis on the Muscle cheeks (see Fig 1) - there is, in my mind, not enough difference when theyre both grey for me to notice anything huge from a distance (this is why you might see the Orcs being used in 40k with little to no complaints). 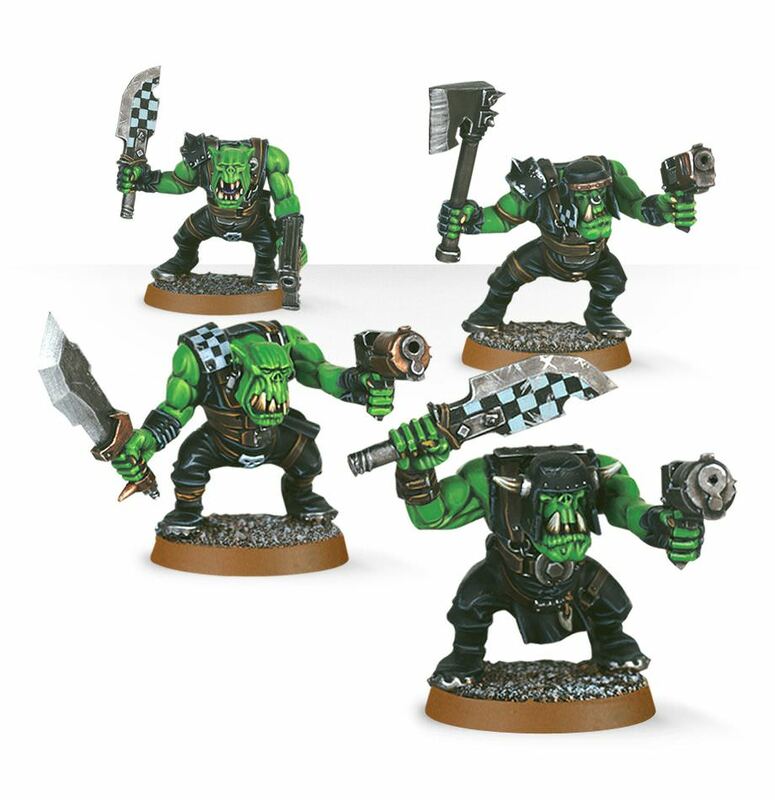 Secondly, the latest 40k sculpts (Flash Gitz, Mek, War boss) all maintain the same box-like sculpt the older range of 40k Orks had (see Fig 2), illustrating how the Orc range is actually moving away from the 40k more angular look (rather than the reverse). 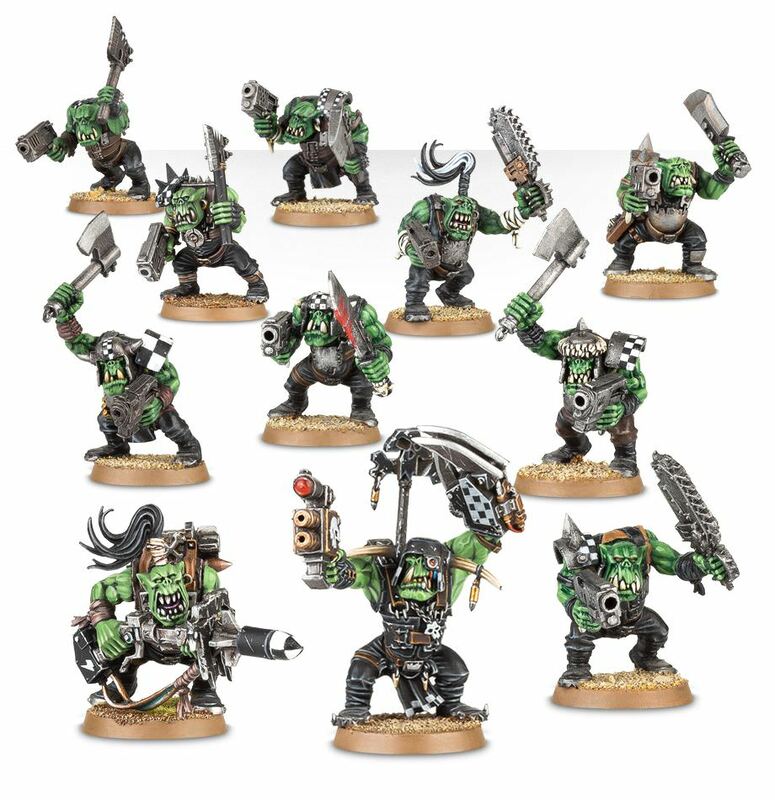 Finally, the new range of 40k Orks are older than the Age of Sigmar/Fantasy Ironjawz Orcs with the newer 40k Ork sculpts coming out in June-July 2014 and the Orcs coming out in 2016, demonstrating how, if anything, the Orcs would likely to have been inspired by 40k Orks, not the other way around. Therefore, we can conclude that 40k Orks are not slowly transforming into Fantasy Orcs when it come to the physical sculpts. Nevertheless, something does seem a little off when it comes to the more modern 40k Ork range that makes them seem just a little bit different in comparison to the older Ork Range. Moving briefly back to the Ork Rumour thread, one of the users (he knows who he is) said that they call the Ironjawz Warboss a cabbage. Moreover, this conclusion, that the Orcs in fantasy look like a cabbage, got me thinking and I began to analyse the colours of each of the Orcs in the Ironjaws range using the images found from GWs store. To my surprise, furthermore, the Orcs themselves are not green! 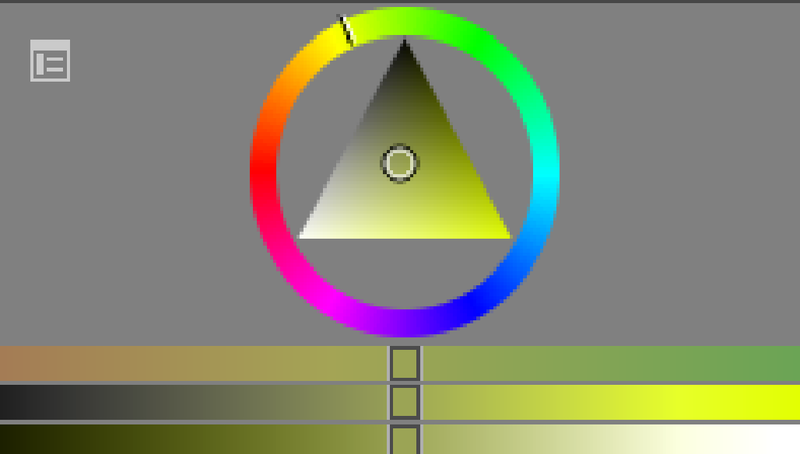 Theyre yellow with the illusion of green skin (see Fig 3 for the colour wheel and the range of colours I found). 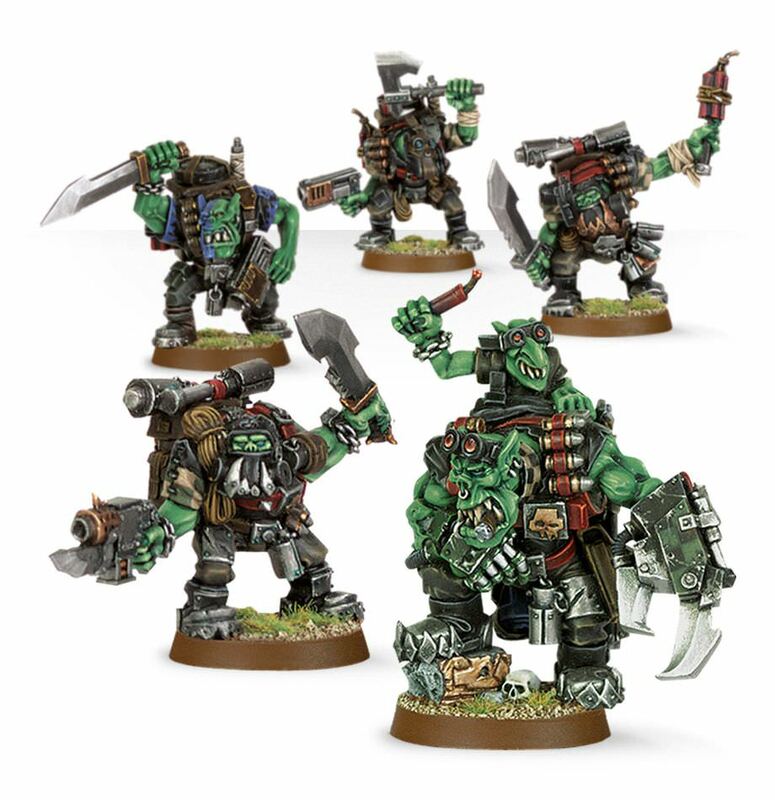 Consequently, I started to analyse the Ork range from the oldest models that are still on sale (again using the images on the webstore) and found them to be the opposite of the colour spectrum. The Wartrakk, for example, is a model that comes from the 1990s itself and, when you analyse the colour of the riders face, its as you might expect, a beautiful Apple Orky Green (see Fig 4). Next, I moved quickly onto two more figures I believed came from the old range The Metal DeffKopta and the Old £6 plastic Boyz kit and again found them to be the same range of Apple Green. Therefore, the reason why I and other people might see the Fantasy Orcs as different might be based primarily on the green vibrant Orks compared to the newer yellow Fantasy Orcs. However, I thought to myself, the old Fantasy Orcs must have been green! and sure enough, after just looking through the older range, the old Fantasy Orcs were a deeper green if not only a little more yellow. They tricked us, and we didnt even know it! Next, I moved my analysis onto the later pre-2014 releases from the Ork range. Moreover, I examined the old Finecast Warboss, the Finecast Kommandos and the newer Plastic Orks Boyz. Likewise, I got a similar conclusion with the Warboss and Kommandos staying in the same range of green (see Fig 5). However, what came to me as a shock is the newer Boyz kit. When I analysed it, furthermore, I noticed that, on average, it just slightly nudged itself more towards the yellow spectrum (see Fig 6). The Boyz analysis is when it clicked! 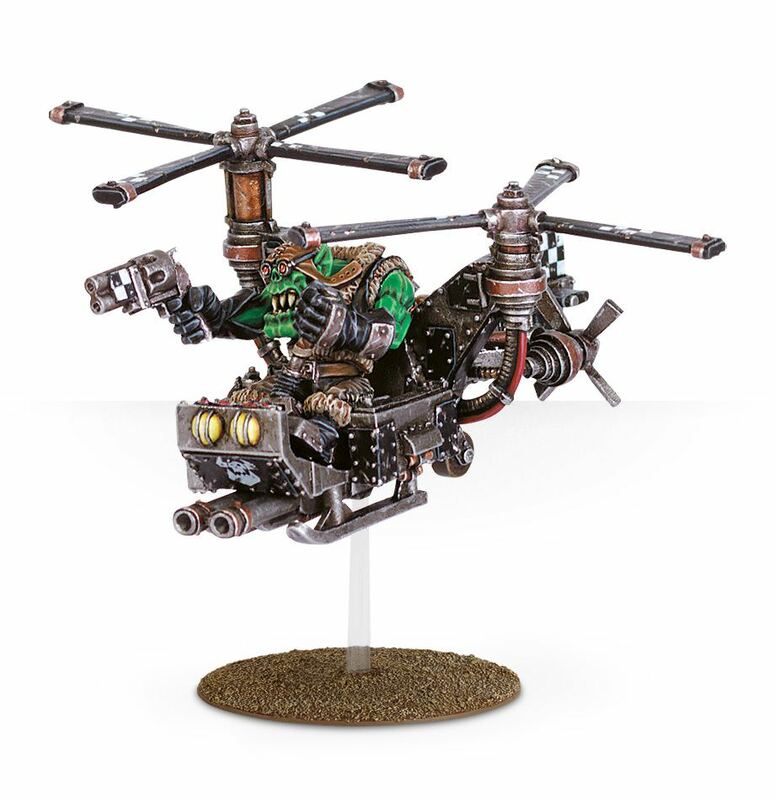 I quickly dragged up the images for the new post 2014 Orks and suddenly found something horrific! 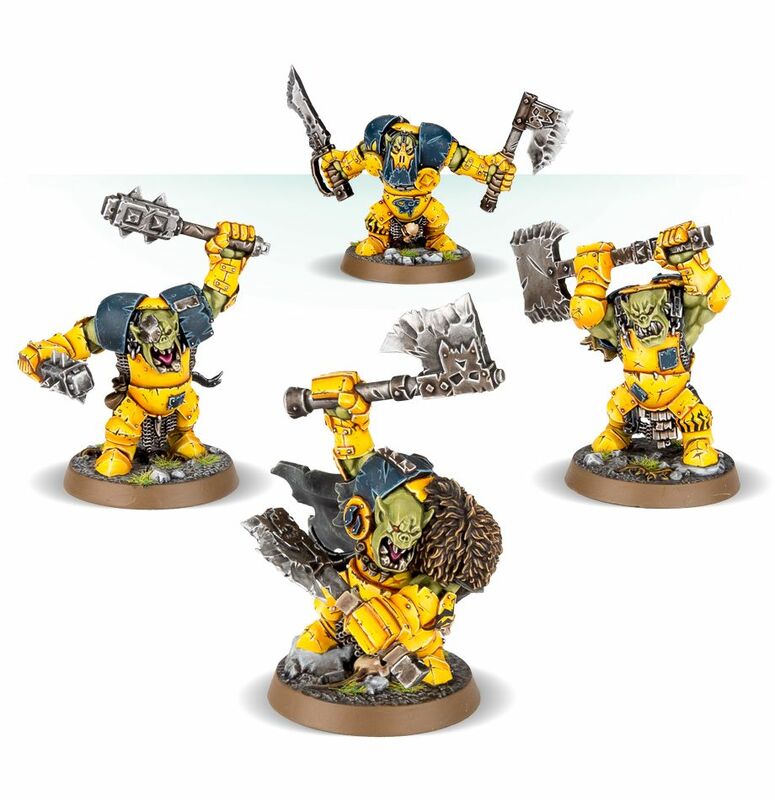 At some point between 2002 and 2014 the painters at Games Workshop had made all our official promotional image of Orks yellow! (see Fig 7 for examples of the models and the primary colour used). Even without a colour wheel, moreover, its clear out Orks are becoming less green in the eyes of GW! Therefore, our Orks are becoming less Orky! We have become more Imperial Fist than Fire Happy Salamanders! Finally, I analysed my own Warboss in comparison to the official GW image. 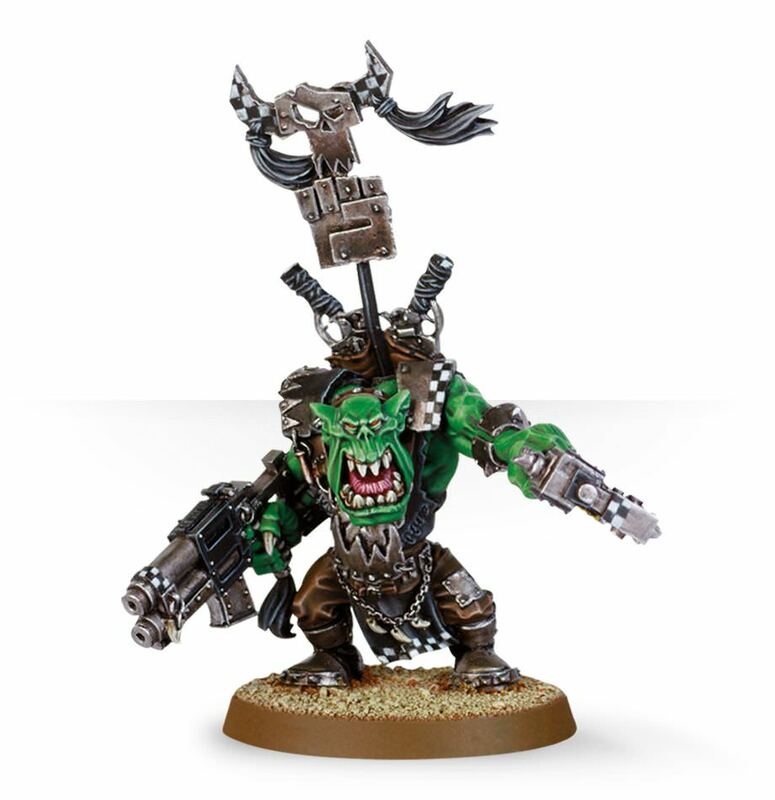 I always considered my Warboss to be as Orky as they come and to my surprise he 100% is confirmed to be greener and, thus, more Orky than anything GW has pushed out as of late (see Fig 8). Conclusion What does this mean? 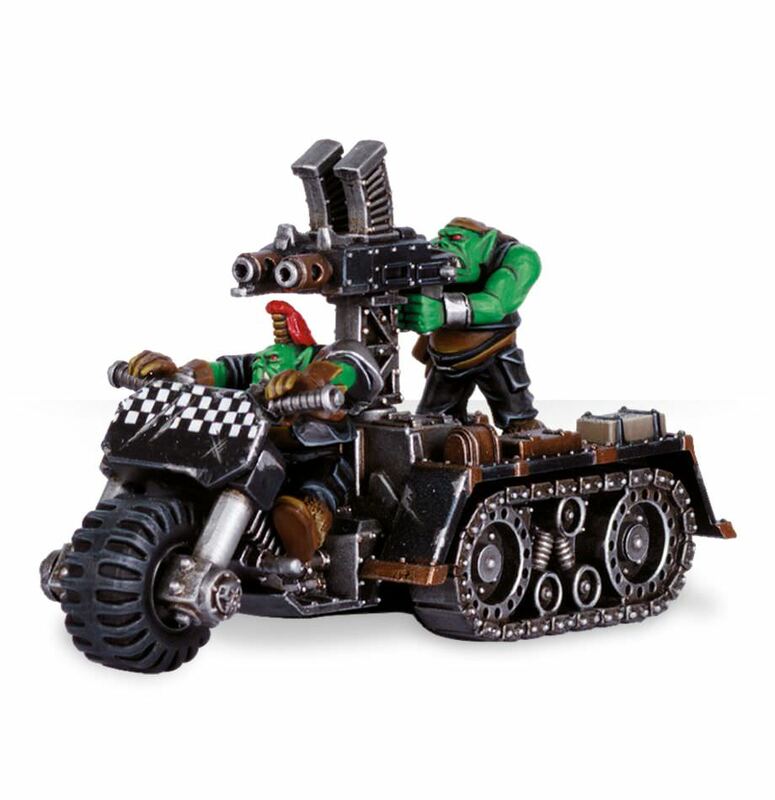 Games Workshop have so little understanding of Orks that they cant even get their colour correct. The change has symbolically turned them from a vibrant interesting unique characterful race with tons of backstory and interesting stories into bland cabbage grim dark bad guys who new players find hard to distinguish from the likes of any other Xenos threat in the galaxy. The Washing out of their colourful greens has caused them to become just as bland as most Modern fantasy Orcs and resulted in them blending into the background of the Table top genre. 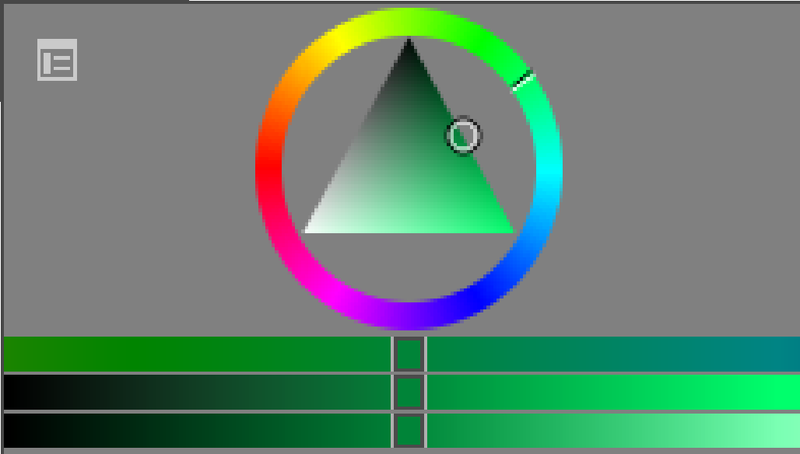 Nevertheless, my analysis is done by an amateur who just used the pen tool in a free program to find the colours of the Orks so its probably super off! Anyway, discuss and argue below as you please, will be funny to see what you guys think. The change in nose shape stands out even more than the palette shift. The older triangular nose is reminiscent of a skull, where the rounded and more protruding shape makes them look like a pig gone wrong. I hadn't noticed the piggy nose look or the way the ears curve back until now, but I also don't necessarily dislike it. It's all Brian Nelson, and if he wants to change things up a bit like that, I'm down. He's not changing thinsg up at all. He's reverting back to where it all started with fantasy orks. Look up any pictures of a fantasy orc for lord of the ring or world of warcraft and you will see them with a more rounded smaller head and a round piggy noise. What makes and made orks so unique (if you look at my analysis) is that they are so different from the Fantasy genre yet instantly recognisable at the same time. 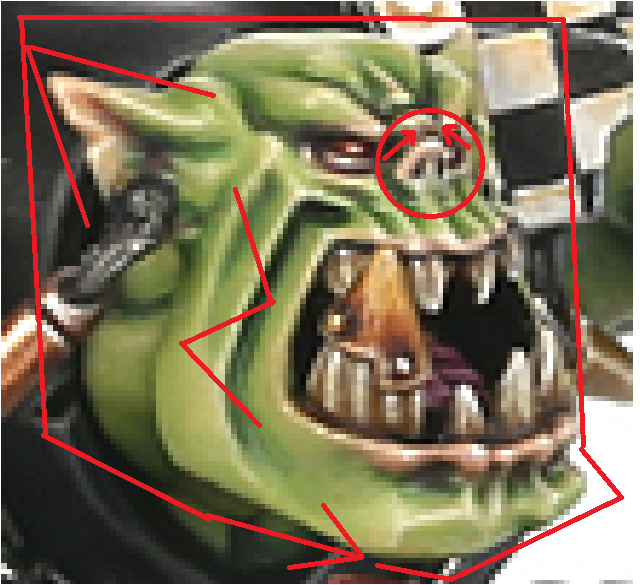 The more pointed triangle box shape of the 40k (seen in the new warboss and the older boy) gives 40k orks a more industrial working class feel. By making Orks more rounded (like people want) your just making Orks even more generic than GW has already made them in the past few years. 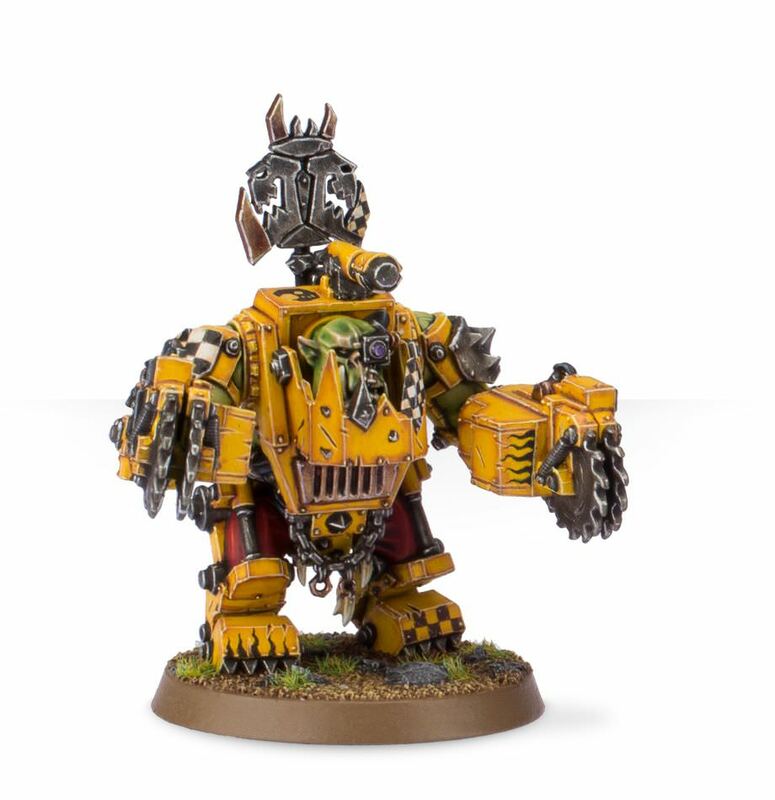 The big mek is a great example as the s ulpt actually follows manynof the same rules that made the orginal modern orks. It has the same triangular features with a squarish face. It makes it seem more sci fi than fantasy. We make the have rounded piggy noses then they'll be doomed to Orcs in space and not the Space Orks they were as people associat them more and more with fantasy. It's very important to keep them similar but separate at the same time. This discussion prompted me to look around for pictures of the early space Orks. Looks like the early models in both fantasy and 40k had fairly rounded faces with relatively human noses. The Brian Nelson sculpts replaced that look with the much larger, squared jaw and triangular skull-like nose. Yeah, they were also more yellow just like the new Orcs but I didn't go into too mu h detail as that requires more effort with writing and formatting. Basically Orks started out as sci fi Orcs but eventually became a unique thing. I'm not sure if you're being tongue in cheek. Its interesting to note that new stuff is a more yellow green, but I'm pretty sure it's still green. I've been around long enough to remember multiple different greens coming out of the Eavy Metal workshop, including some that more yellow than the pics you've shown. Im going from memory here, but the Evil Suns models in the 2nd ed codex were way too yellow for my liking. I think the biggest change is faces. 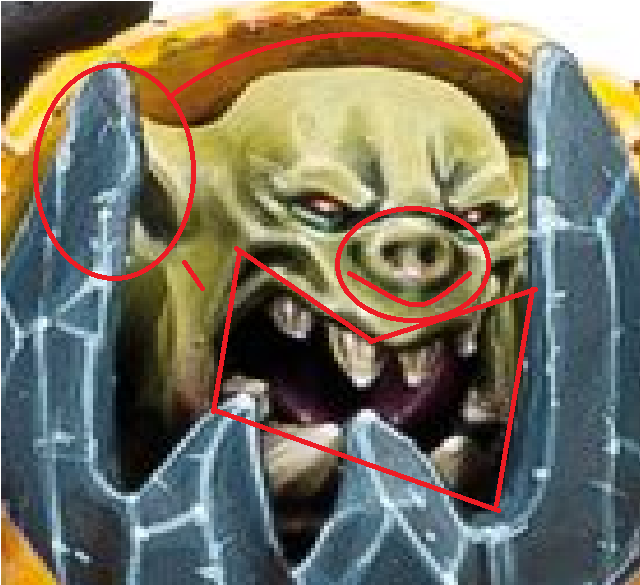 I hadn't noticed those rounded noses on the orruks. But remember the old humanesque noses that Brian did away with after 2E. I was recently outvoted in another thread when i suggested the new faces were.... not very good.... But I'm sure that someone who was cleverer at at than me could demonstrate that they're definitely different. Im, like, 95% sure the AoS MegaBoss was Nelsons work, and Im pretty sure he was mentioned in official sources as having sculpted some of the new Nighthaunt models for AoS. Dude...zi outright say at the start this is a troll post. But u gotta admit, they are less green. I think the biggest change is faces. 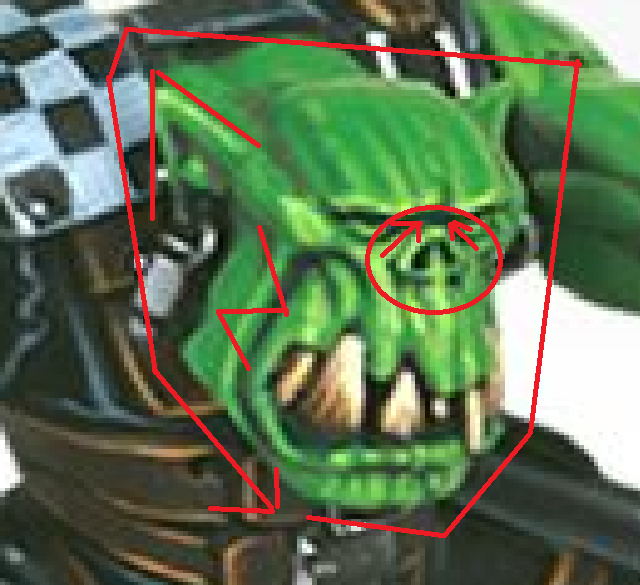 I hadn't noticed those rounded noses on the orruks. But remember the old humanesque noses that Brian did away with after 2E. .... But I'm sure that someone who was cleverer at at than me could demonstrate that they're definitely different. It's an interesting dilemma if someone wanted to make a real analysis on them. But i do like the 3rd edition heads a lot more... i do like boxy things. 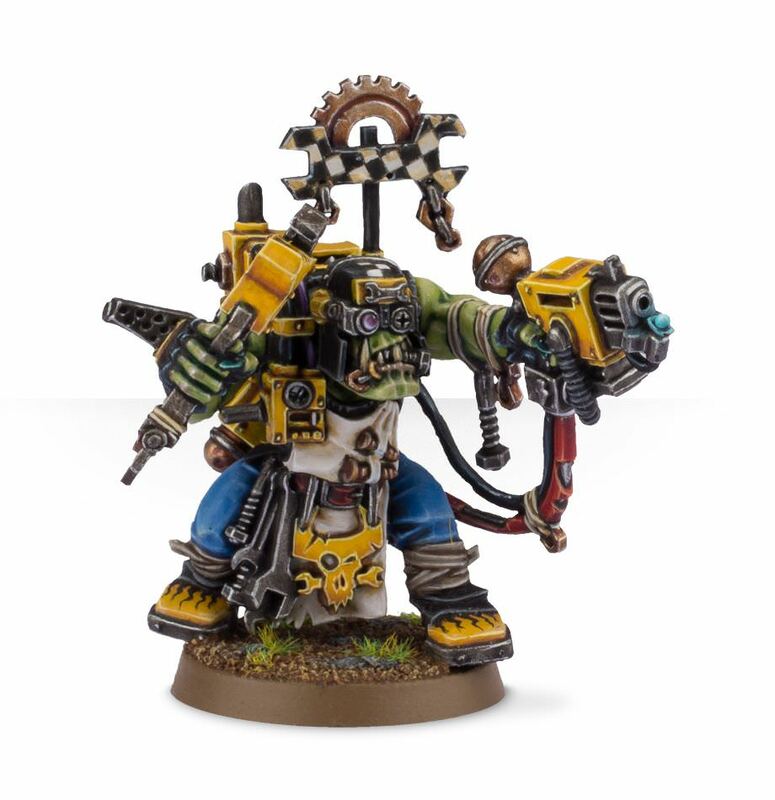 I think the yellows and purples and pinks we see on the higher level paint jobs is because a straight green ork doesnt give those high level painters much to show off or play with. Also the new orruks have less muscular definition than orcs had. If painted straight green they'd look like toys. All this means is the yellow Orks are less Orky than the green Orks. So the more Orky Orks must krump the less Orky Orks to set right this mighty troubling un-Orky ork Orkiness! Smash da yellow orkz to make da green orks stronga! Figures, like many other things (autos for instance), evolve over time, for the better or for the worse. Personally, I prefer the older (series 1 & 2) heads for their expressions. However, the modern body represents what an Ork should look like physically (get rid of the "Headin' for the drops fast!" posture though). 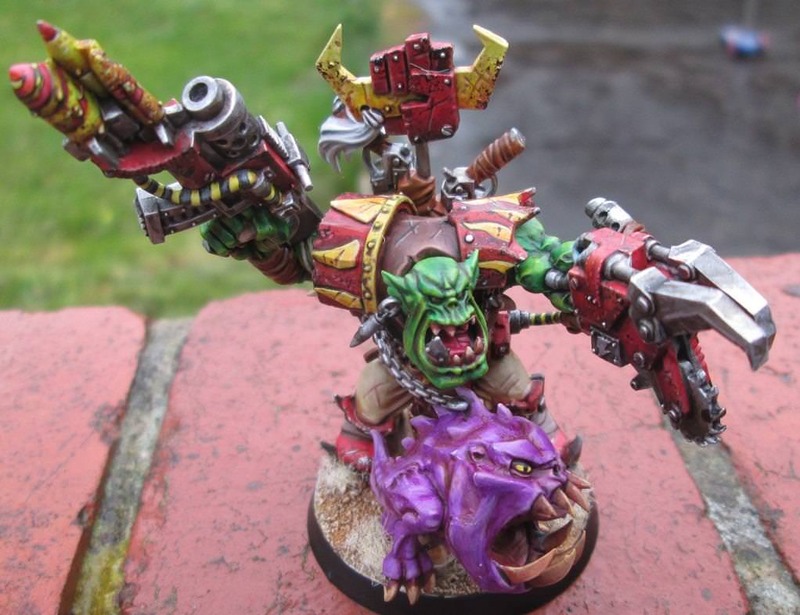 "I think the yellows and purples and pinks we see on the higher level paint jobs is because a straight green ork doesnt give those high level painters much to show off or play with." I agree with PhillyT, the lighter tone allows for more artistic freedom. 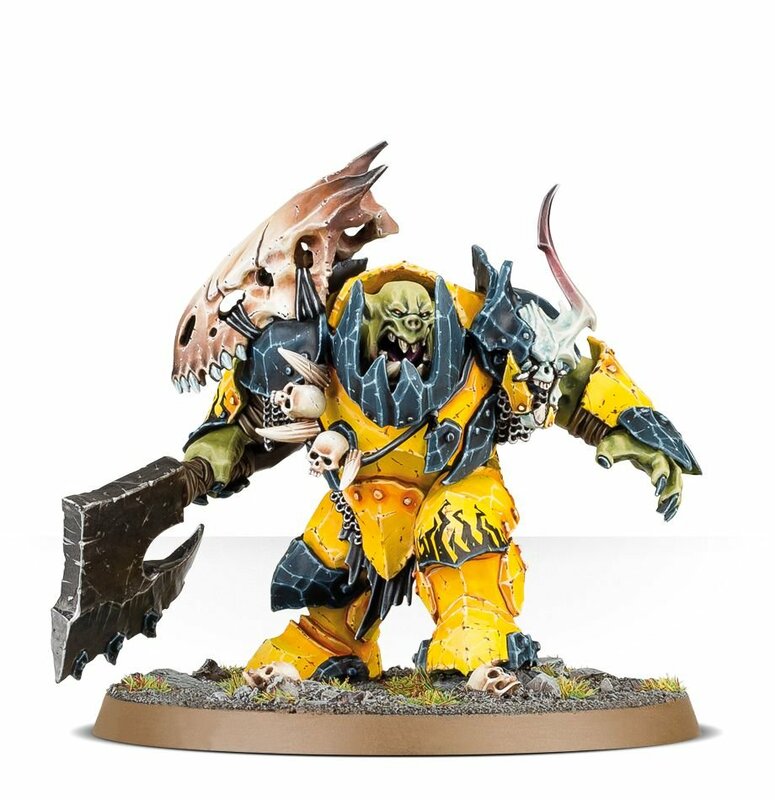 I will point out that Ironjaw's Orruks are in bright yellow armor. 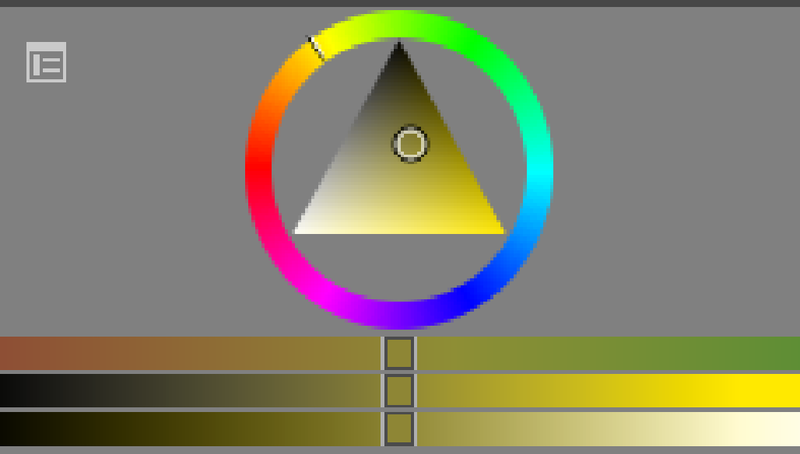 The yellow armor alters your perception of the skin color (makes it appear lighter and more yellow), the skin is actually darker, and more green that what is perceived. 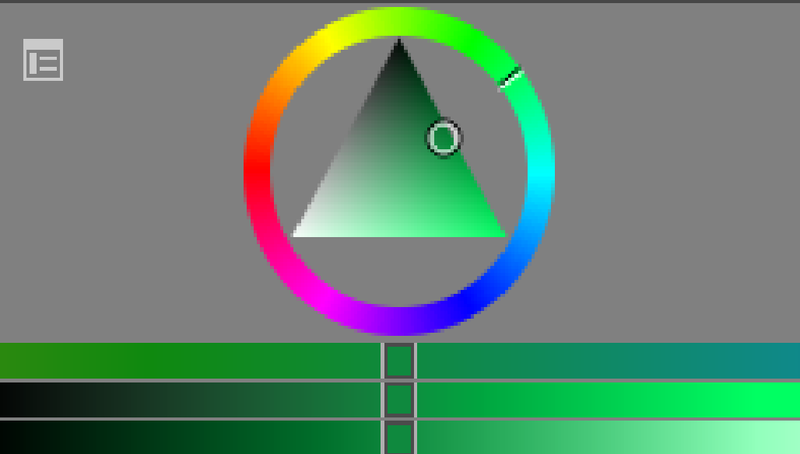 Still, it is obviously not a bright green. (Just to be clear. I knew all this when I wrote this article. This was just a joke because someone siad they look like cabbages now). Me greenz me smash yellow panzees!